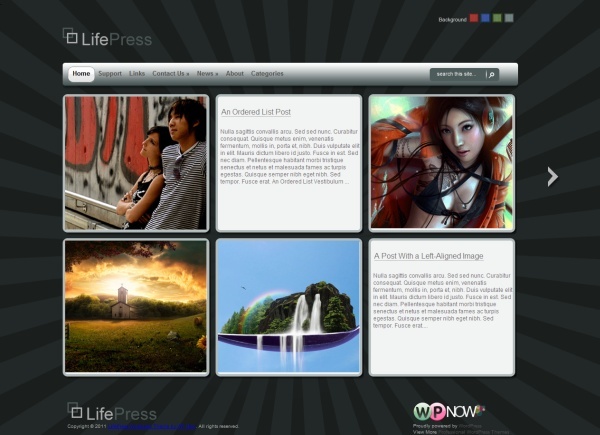 The LifePress theme is a personal blog or portfolio theme that offers a creative, unique way of displaying your content. Unlike the traditional blog or magazine-style format, LifePress let imagery tell your story first… and when you get your visitor’s attention, he or she can click to get more information about the specific post. The theme offers simple and clean homepage with the latest posts and the visitor can dig in further into the information he is interested in. The premium WordPress theme LifePress is of course WP 3.0 ready and supports 3.0’s custom menus functionality, it also offers an Intuitive Theme Options Panel, a SEO-Friendly Title Tagging & Meta Tagging functionality Built-In and you get AJAX post display on homepage. 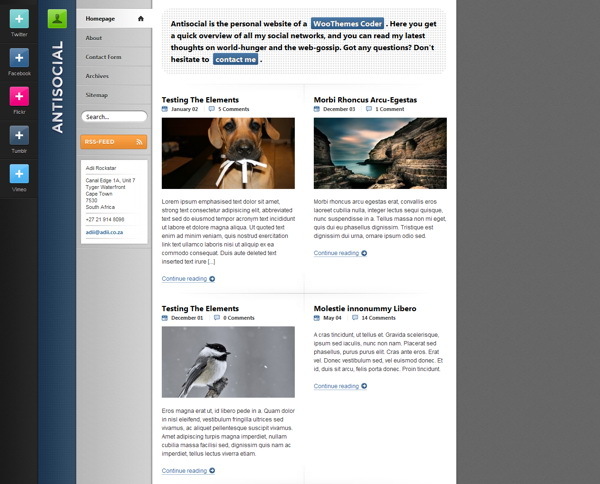 The theme is using Two-Column Layout, is Widget-Ready, comes with 4 different Color Schemes and you can either Set One or Let Your visitors switch in between them, there is also a Menu & Submenu ‘Show’/’Don’t Show’ Customization as well as Five-Level Threaded Comments functionality built-in. Antisocial was designed by Tim Van Damme Antisocial is the perfect online business card and personal blog theme to aggregate all your online profiles in a beautiful slick and unique design. The theme has vCard and hCard facilities for accessible contact details. There are 3 completely widgetized zones with 5 custom widgets including a neat re-usable social profiles widget and dedicated zone, a neat AJAX calendar widget that is beautifully styled, a unique comment form with a JQuery plugin that grabs your Gravatar without a page refresh and 10 amazing color schemes to choose from. Making simple changes without editing code, like adding your own logo, changing to an alternate color style, adding Google Analytics code, couldn’t be easier with the back-end theme options panel. The theme is compatible with all the modern web browsers like Firefox, Safari, Chrome and Internet Explorer. There is an image resizer script built into the theme framework to automatically scales your post images for pixel perfect display in our templates. No need to upload new cropped images when re-designing your website. It comes packaged with a .po file for easy WordPress theme translations into your desired language – editing one neat little file without hunting down text in the theme templates. 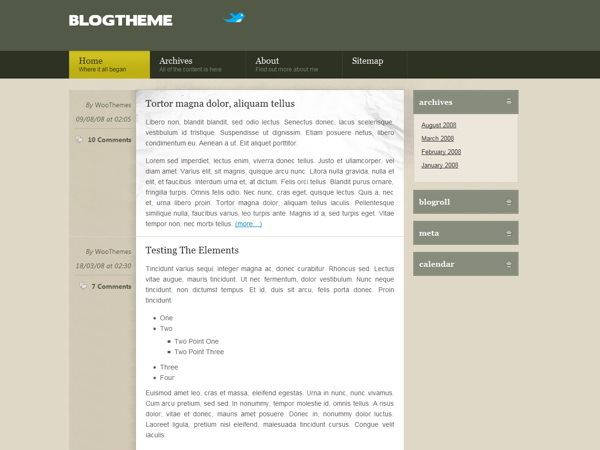 BlogTheme does the simple things well and therein lies to power of this personal blog theme: great structure, trendy style and some nifty jQuery effects in the sidebar. So what’s left for you to do? Well, you can start by adding content. The theme has a Twitter header banner showing your most recent tweet. You get a nifty accordion sidebar, which displays only the content that the user decides to display, a widgetized sidebar to allow you full control of what happens in your sidebar and 5 vibrant color schemes to choose from. Making simple changes without editing code, like adding your own logo, changing to an alternate color style, adding Google Analytics code, couldn’t be easier with the back-end theme options panel. The theme is compatible with all the modern web browsers like Firefox, Safari, Chrome and Internet Explorer. There is an image resizer script built into the theme framework to automatically scales your post images for pixel perfect display in our templates. No need to upload new cropped images when re-designing your website. It comes packaged with a .po file for easy WordPress theme translations into your desired language – editing one neat little file without hunting down text in the theme templates.